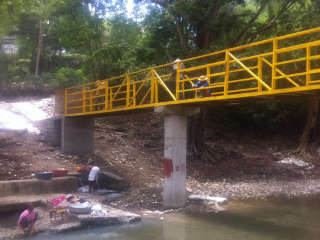 New bridge near the bakery Francesca Rava for Fond Des Blancs community. A new bridge has been constructed near the bakery Francesca Rava. Due to frequent flooding of the Lhomond River during rainy season, this new bridge is very important for the community of Fond Des Blancs for safe travel along a frequently used route.